This 1440 serving food bucket from Survival Food will ensure you and your family have the food you need in an emergency. 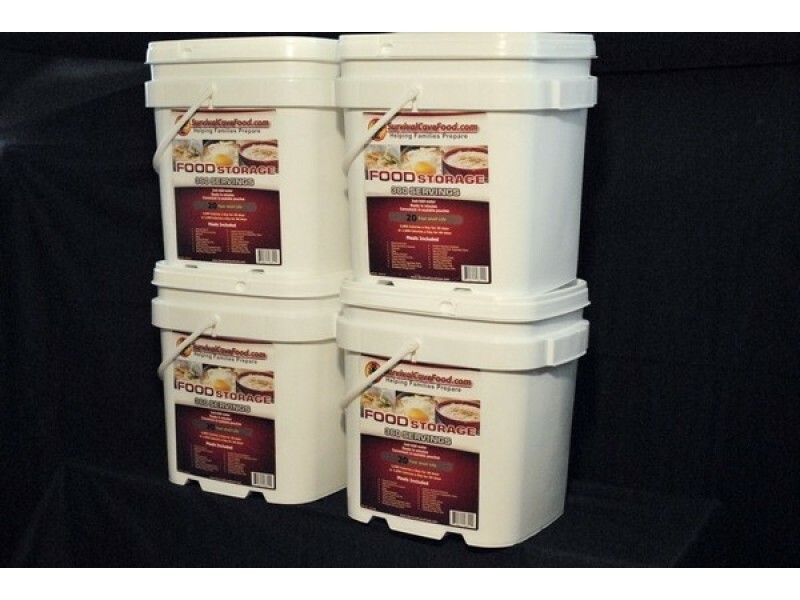 Survival Cave Foods has made this great 1440 serving bucket as an easy way to ensure you and your family have all the food you need during an emergency. It has enough food to provide 2000 calories per day for one person for four full months. Whether you order one for each member of the family, or split up one between everyone, this is going to be enough food to get you through most emergencies. Building up a stockpile of food is essential for staying safe during emergencies or disaster situations, and that is just what this 1440 serving bucket from Survival Cave will do. Each order will provide you with dozens of pouches filled with high quality, freeze dried foods that are specifically chosen to have all the essential vitamins, minerals and other nutrients you need to stay healthy. The high quality packaging protects the food for 25+ years on the shelf, so it will be there when you need it. Each order comes with multiple servings each of all natural granola, apple blueberry granola, wholesome oatmeal, fluffy scrambled eggs, creamy chocolate pudding, mixed fruit, Italian style polenta, beef flavored vegetable soup, cheesy cheddar broccoli soup, a refreshing orange drink, creamy mashed potatoes, chicken flavored vegetable soup, elbow macaroni and cheese, southwestern style chili, hearty potato soup, mixed vegetables, Cajun red beans and rice, whey milk and whey chocolate milk. This diverse mix of foods not only tastes great, but also helps to ensure you will be getting all the important nutrients you need. Unlike many other emergency food systems, this one comes with the fruit and vegetables you’ll need to get the types of nutrients that can only be found in this type of food. All the foods are fully cooked, and only need to have water added to prepare and enjoy.